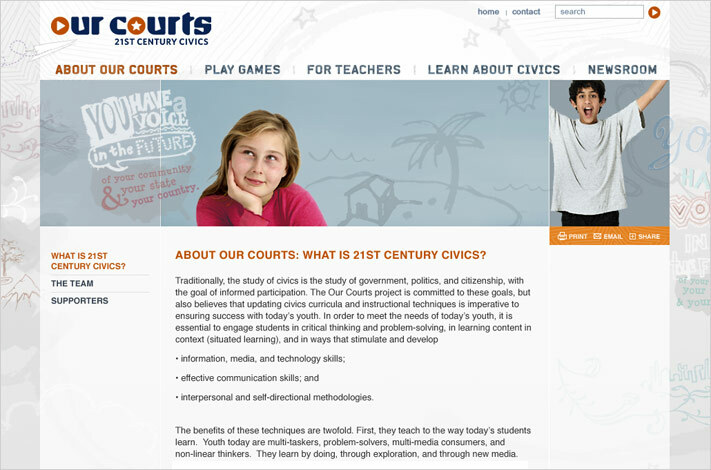 Our Courts (now known as iCivics) is a free, interactive, web-based program designed to fill the information/ inspiration gap in civics education. 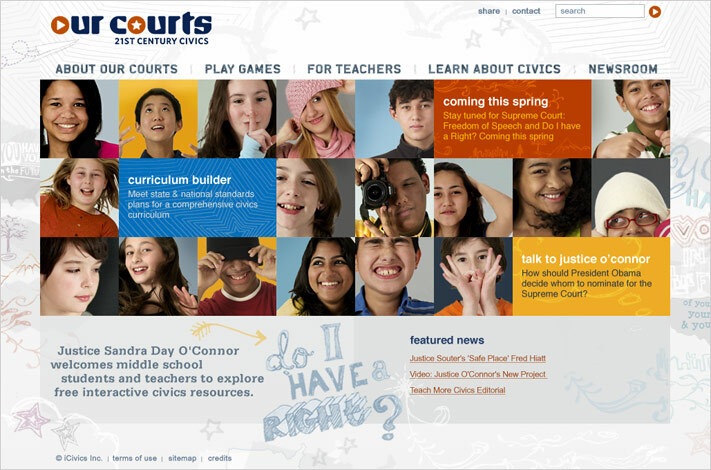 The vision of Retired Supreme Court Justice Sandra Day O’Connor, Our Courts hopes to promote civics education in the schools by creating discovery-based learning games for students and useful classroom resources for teachers. Georgetown University Law Center, The College of Teacher Education and Leadership at Arizona State University, and Sandra Day O’Connor College of Law at Arizona State University are the three lead partners in this initiative. Our Courts selected Cabengo as its interactive partner in the development of the Our Courts identity and website. 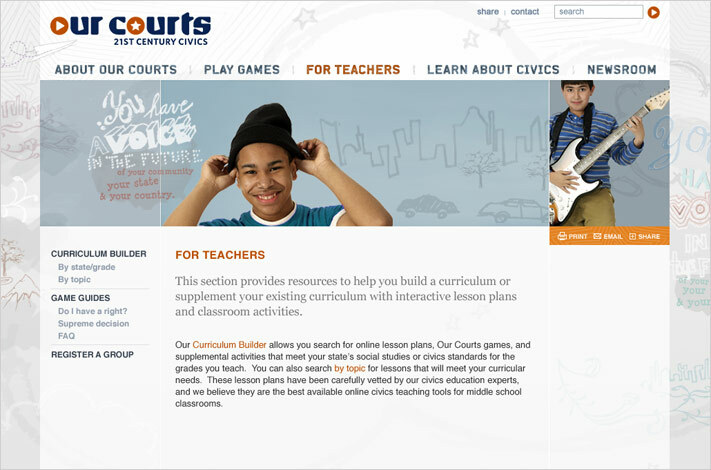 We worked closely with the Our Courts team to develop an identity that expressed “civics” and “fun technology” to a youth audience as well as to teachers. The result is a distinctive word mark in which we embed the core concepts – civics and technology – into the letterforms. 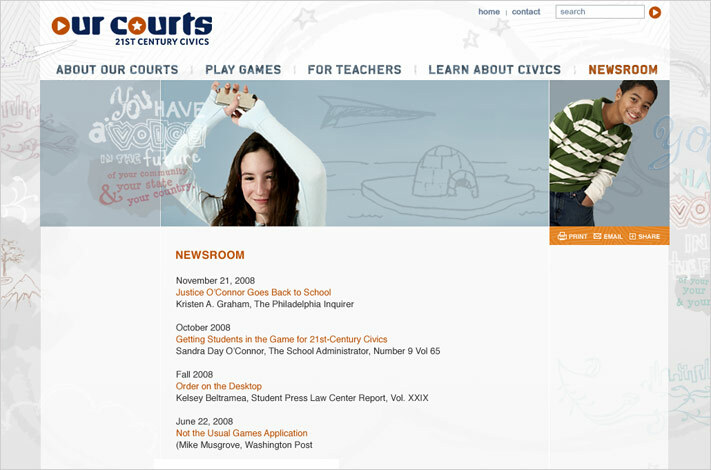 The “play button” O activates the line, inviting users to “Play Our Courts” while making reference to games and rich media. The star in the second O is a nod to patriotism and the flag. The mark is confident and appealing, reproduces well across media, and scales well for multiple uses and applications. Cabengo worked with the client team to define the requirements for the website and content management system, then developed an architecture strategy that reflects the project’s strategic objectives, target audiences and priorities. Detailed page schematics mapped the interactivity, functionality, architecture and content organization of the website. 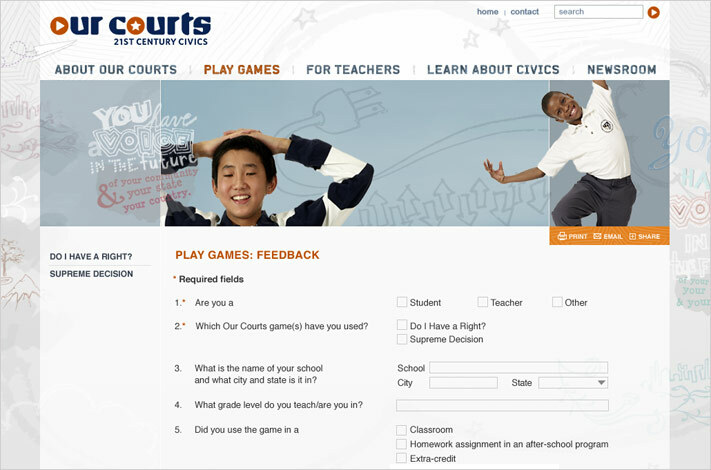 The site look and feel needed to present Our Courts, and, by extension, civics, as fun, cool, active, empowering and relevant to the lives of real kids. As the launching pad for Justice O’Connor’s vision, we wanted the website to feel vital and optimistic. So we invited real kids to a photo shoot and let them tell us something about themselves in front of the camera. The portraits that emerged ran the gamut, from funny and confident to meditative and proud. We wove the portraits together into an energetic grid. Each portrait teases the edge of its individual frame, setting into play a lively, multi-directional conversation. The drawings around the edges of the pages, a sly reference to doodling in school, underscore the values of creativity, self-directed learning and fun in civics education. As part of this initiative, Cabengo worked with the Our Courts team to develop Supreme Decision, an in-classroom game in which the player helps a Supreme Court Justice cast the deciding vote in a student’s rights case.